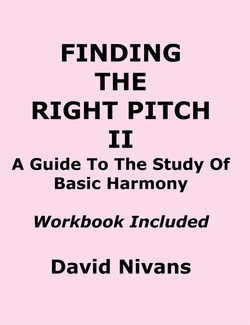 A preview chapter from David Nivans's Finding The Right Pitch II: A Guide To The Study Of Basic Harmony is available here as a free download. This chapter is a 57-page review of music fundamentals distilled from Finding The Right Pitch: A Guide To The Study Of Music Fundamentals. Printable example of keyboard harmony from Appendix A of Finding The Right Pitch II. Jeppesen, Knud. Counterpoint: The Polyphonic Vocal Style of the Sixteenth Century (New York: Dover, 1992). Salzer, Felix and Carl Schachter. Counterpoint In Composition (New York: McGraw-Hill, 1969). Schenker, Heinrich. Counterpoint. 2 volumes. Edited by John Rothgeb (New York: Schirmer, 1987). This is by no means an exhaustive list, but these great books count among the most important works in the field of counterpoint. Finally, we strongly recommend that you acquire some knowledge of music fundamentals before attempting to meet the challenge of writing species counterpoint as outlined in the free downloads below, for the information offered here is not without its difficulties.